Editor’s Note: The following is the description of the luminous comet that streaked across the sky disappearing behind the holy hill of Arunachala at the time of Sri Ramana Maharshi’s Mahasamadhi. The devotees who saw it from far away realized that it was an “announcement” that Bhagavan Ramana had entered Mahanirvana. At about 9 p.m., Monsieur Cartier-Brassen, the French photographer, who has been here for about a fortnight with his wife, related an experience of his to me. “It is a most astonishing experience,’’ he said. “I was in the open space in front of my house, when my friends drew my attention to the sky, where I saw a vividly-luminous shooting star with a luminous tail, unlike any shooting star I had before seen, coming from the South, moving slowly across the sky and, reaching the top of Arunachala, disappeared behind it. Mercedes De Acosta was asking Sri Ramana Maharshi about which religion, teacher, or guru she should follow that would be most helpful to her. The Sage of Arunachala, Sri Ramana Maharshi, gave us the purest teachings. 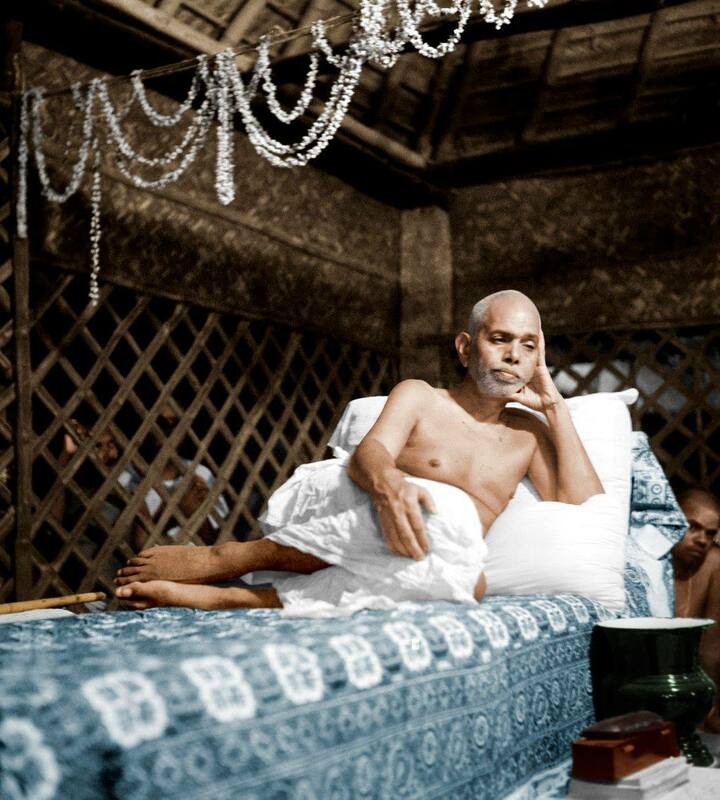 If we look at the devotees of Sri Ramana, we see that they were some of the greatest yogis and jnanis of their day. Many of them were world class poets and scholars. But they led quiet, unpretentious, and humble lives fully content in the grace of Bhagavan Ramana. In outward appearance, Sri Ramana appeared as an ordinary sadhu sitting quietly on the rocks of Arunachala, and wandering the holy hill at times. The yogis of the highest wisdom upon meeting him recognized him instantly as the king of yogis, serene and content, whose very presence was the blessing they had been seeking. The message of Sri Ramana is simple and echoes the Upanishads. Did I go from being a neurotic worrier to a goddess radiating mega-rays of tranquillity in a few short weeks? Sorry, but this ain’t no fairy tale. The sad truth is that I was born with a depressive gene: to see a glass as half-full instead of half-empty can still often be for me a true labor of Hercules. But by putting a positive spin on my life, my fears shrank, my vision cleared, and I could move forward with increasing confidence. Still, there were many times since that I found myself embroiled in situations so dark I could not find a single reason to be grateful. Sri Ramana used to say that wherever we go, our mind follows. We cannot escape our troubled mind riddled with endless concerns, anxieties, and fears. Even if we run away to a forest or some holy place or sanctuary, the mind is still with us. Truly, the conflicted and conditioned mind is like our shadow.